Welcome to last day (Day #7) of Chocolate and Strawberry Theme Week. 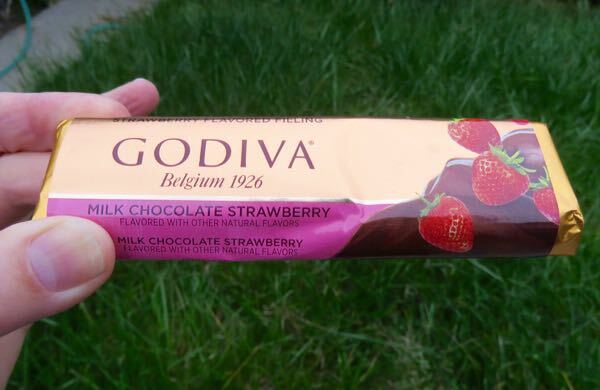 This very sweet* Milk Chocolate Strawberry Flavored with Other Natural Flavors bar was from Godiva Chocolatier, Inc.** (New York, NY). 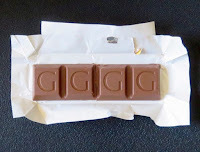 Scored into four squares (with each square stamped with a "G" for Godiva), the milk chocolate contained a creamy strawberry flavored filling. 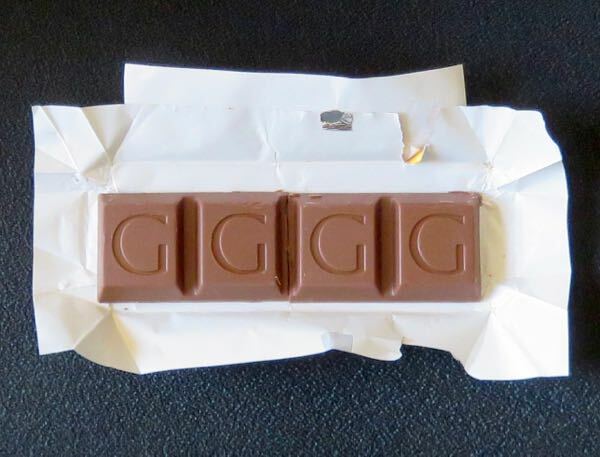 This bar may appeal to those who like chocolate candy and sweet fruit flavors. A note about this week's outdoor photos of chocolates...Green spring grass lasts but a few months in the arid west, and it makes a good backdrop for early morning photographs of chocolate when the sun hasn't found its way inside yet. *This bar contained sugar, corn syrup, high-fructose corn syrup and invertase (an enzyme produced by yeast that helps break down sugar) commonly used in the candy industry with liquid fillings, to help prevent crystallization. 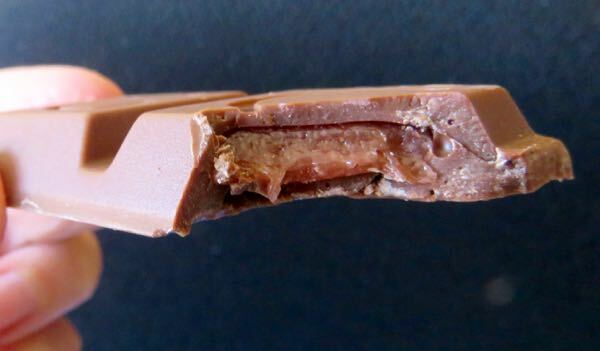 An unintentional situation that seemed to prove this point: this Godiva bar we bought had obviously been exposed to heat and was covered with white patchy "bloom" spots as a result; however, it still had a flawless, unified flowing strawberry cream center. **Godiva was founded in Belgium in 1926; and the Godiva brand has been owned by a few different large companies in recent decades (including Campbell Soup and Turkish Yildiz Holding—owner of the Ulker Group).